THERE IN NOT A SIDE PANEL INCLUDED WITH THIS UNIT. THERE ARE 2 UNTESTED OPTICAL DRIVES INCLUDED. THIS UNIT POWERS ON AND HAS BEEN TESTED TO BOOT TO SETUP/BIOS SCREEN AS PICTURED. Up for your consideration is a COMPAQ PRESARIO SR1503WM TOWER PC desktop w/2GB MEMORY, a PENTIUM 4 HT(hyper-threading) 3.06GHZ PROCESSOR and a SEAGATE 250GB 7200rpm HARD DRIVE. It also operates a ATI VISIONTEK RADEON 3450 GRAPHICS CARD and has all of the latest updates with WINDOWS 7 PROFESSIONAL operating system. It's ready to go!! Also included is the POWER CORD and FREE SHIPPING!! No other components are included (i.e. keyboard, mouse, monitor etc.). This is a very good computer for general computing and with the mentioned upgrades is pretty fast. It has been cleaned from top to bottom, inside and out. Questions are welcome and thanks for looking. For your consideration is a COMPAQ PRESARIO SR1810NX Desktop PC Tower with a SEAGATE 320GB 7200rpm HDD w/WINDOWS 7 PROFESSIONAL, AMD ATHLON 64 x2 DUAL CORE 4600 2400mhz (2.4GHZ) PROCESSOR and 2GB of MEMORY. It has been cleaned from top to bottom and restored to original condition except the mentioned modification upgrades and maybe a very few un-noticeable scratches from normal use over the years. It is a good working computer and will be great for general computing and maybe even some light gaming. The POWER CORD is included and so is FREE SHIPPING!! However, no other components are included (i.e. monitor, keyboard, mouse etc.). Questions are welcome and thank you for looking. AMD Athlon 64 X2 4850e 37 °C. ECS Iris8 (Socket AM2 ) 18 °C. ATAPI DVD A DH16A6L-C SCSI CdRom Device. Optical Drives. 232GB Hitachi HDP725025GLA SCSI Disk Device (RAID). 128MB NVIDIA GeForce 6100 nForce 430 (HP). COMPAQ PRESARIO SR1910NX PC Windows XP Pro SP3. Processor: AMD SEMPRON 1.8GHz. Storage: 120GB HDD. Clean install of Windows XP Pro, Hardware functioning, No "Device Manager" conflicts. THERE IS NO HARD DRIVE INCLUDED. THERE IS AN UNTESTED OPTICAL DRIVE INCLUDED. THIS UNIT POWERS ON AND HAS BEEN TESTED TO BOOT INTO BIOS AS PICTURED. Warranty covers hardware issues only and excludes problems caused by abuse or tampering with components. Problems from installing internet service need to be directed to your ISP (Internet Service Provider) directly. COMPAQ PRESARIO SR1010NX CUSTOM 2.53GHZ PENTIUM 4 WINDOWS XP . What you see in the photos is what you'll be getting (just the desktop without a monitor, keyboard & mouse). THERE IS AN UNTESTED OPTICAL DRIVE INCLUDED. THIS UNIT POWERS ON AND HAS BEEN TESTED TO BOOT TO SETUP/BIOS SCREEN AS PICTURED. THERE IS AN UNTESTED OPTICAL DRIVE INCLUDED. THIS UNIT POWERS ON AND HAS BEEN TESTED TO BOOT INTO BIOS AS PICTURED. AMD Sempron 3400 . 160GB Hard drive. THIS UNIT POWERS ON AND HAS BEEN TESTED TO BOOT INTO BIOS AS PICTURED. Features include. AMD Athlon 64 2.5GHz CPU. 500GB Hard Drive. 4GB DDR2 RAM. USB WiFi W Antenna. Built in Ethernet Port. 19" Wide Screen DELL LCD Monitor. Front Case Single USB Port. THERE IS AN UNTESTED OPTICAL DRIVE INCLUDED. THIS UNIT POWERS ON AND HAS BEEN TESTED TO BOOT TO BIOS AS PICTURED. THERE IS NO HARD DRIVE. THERE IS AN UNTESTED OPTICAL DRIVE INCLUDED. THIS UNIT POWERS ON AND HAS BEEN TESTED TO BOOT INTO BIOS AS PICTURED. Model: Presario sr5410f. Processor speed: 1.80 ghz. Make: Compaq. SUM Computers Inc. Condition: Used - working - power cord included. No Checks or escrow. Condition: Super Clean, like New. Pentium 4 3 GHZ Processor, with Hyper Threading( Pretty much a dual core), 2 GB Ram, 200 GB HDD. Has two DVD RW drives, a Light Scribe Multi Recorder, and Plextor PX-708A. THERE IS A NO HARD DRIVE. THERE IS AN UNTESTED OPTICAL DRIVE INCLUDED. THIS UNIT POWERS ON AND HAS BEEN TESTED TO BOOT INTO BIOS AS PICTURED. THERE IS A SINGLE WIPED CLEAN 40GB HARD DRIVE. THERE IS AN UNTESTED OPTICAL DRIVE INCLUDED. THIS UNIT POWERS ON AND HAS BEEN TESTED TO BOOT INTO BIOS AS PICTURED. 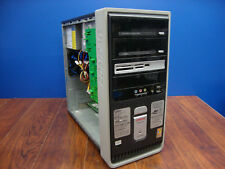 COMPAQ PRESARIO SR5010NX TOWER PC. 80GB HARD DRIVE / NO OS. SEE PICTURES.